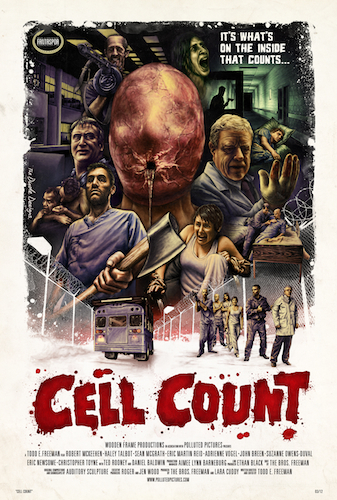 New Poster for Cell Count from Artist Tom Hodge. Mar - 09 | By: Todd E. Freeman | no comments. PORTLAND, Oregon (March 09, 2012) the announcement just earlier this week that “Cell Count” was chosen as the Closing Night Film and to also have it’s World Premiere at this years Fantaspoa Film Festival in Brazil we thought it would be a great time to show our new poster from the amazing Tom Hodge at The Dude Designs. Cell Count is the story of Russell Carpenter who “reluctantly admits his wife Sadie into an experimental treatment facility for her life threatening disease. While locked in this prison like surrounding they, along with 6 others, are unknowingly subjected to a cure that might just be worse than the disease itself.” The film stars Robert McKeehen (Leverage) Haley Talbot (Grimm) Ted Rooney (Boardwalk Empire) and Daniel Baldwin. “We are so excited to have our World Premiere at this year’s Fantaspoa Film Festival. We’ll be among some of the very best Fantastic Cinema has to offer from around the world. Our intent from day one was always to make a film for enthusiasts of the Sci-Fi and Horror genre. It’s going to be a blast to see it in a theater full of genre fans for the first time.” – Writer and Director Todd Freeman. Tom Hodge, The Dude Designs says, “For Cell Count I wanted to create a modern illustrated montage poster. A lot times of this type of work can get labeled as ‘retro’ but i really wanted to show that this type of art is still as fresh, fun and relevant for today’s movie market in 2012 as it was back in 1972. Cell Count is the type of movie that can benefit from this school of poster art as there is so much going on, so while you could just depict one isolated character or image to promote the film, it wouldn’t really tell you the whole story and my main aim for the design was to capture all the rich nuances, characters, plot twists and atmosphere of the movie to build this static trailer. Cell Count’s production company, Wooden Frame Productions, is currently in talks with Sales Agents as well as Distributors from all over the world.